As stated in my blog post from January 16, I have rededicated myself to using social media for learning at work. Following the strategy I outlined on January 24, each of my team members is now actively engaged in managing various topics on the corporate social media network (yammer). This marks the end of the first week of us using yammer at work. So far we are off to a great start. Team member #1 is the topic leader for the discussion on #remote_teams. As discussed in last week's blog post, remote management and virtual teams are fast growing trends in my company. We have included remote management as a topic in all of our recent management training programs. It seemed only natural to continue the discussion through our social media network. Team member #2 is the topic leader for the discussion on #project_management. As I'm sure is the case in all companies, project management is an important topic. A few years back we began to take an enterprise wide look at how projects were managed inside the company. We have been gradually migrating different departments to take a uniform approach to projects. Our current approach is aligned to the PMBOK guidelines. Team Member #3 is the topic leader for the discussion on #change. Our company is transforming the way we do business. This has meant large and small scale changes taking place in every business unit and every department. Each day this week team member #3 has shared some of the myths and realities about workplace change from The Employee Handbook of Organizational Change by Price Pritchett. In addition to these topics, I personally lead the discussion on the topic of #managing. All four of us participate in each other's discussions and we also post to disucssions on #leadership, #engagement and #growth. Besides managing these topics, we are active in several newly formed yammer groups. 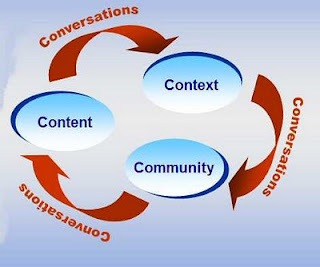 Our goal is to deliberately create an information pipeline around important management topics that can be captured as informal learning through the social media network. To help us get a jumpstart on building our followers, I created the flyer shown below. This week I participated in a management kick-off meeting that was attended by over 300 managers. Our Learning & Performance group had an "expo-like" table set up at the event. I handed out many of these flyers and talked to a lot of managers about our new social media network. Very few of them were aware that yammer was available inside the company. Most of them had never even heard of it. Although it is new, I'm confident that our social media network will grow quickly. There are only a handful of users today, but I'm sure there will be many more very soon. I want my team to be active and ready to guide others how to take advantage of this tool for informal learning when they get there. From these small beginnings, I expect great things to occur. I'm following your progress with great interest. I know things might be slow at the start, but I think your approach makes sense. Look forward to more! Mike, this is really interesting, and a great idea. About 18 months ago, a cutting edge SONY Entertainment supervisor told me they were using Yammer internally - not sure whether he meant London and Tokyo too, or just San Diego, but he thought it was helping them get their edge back. The way you describe this also reminds me of the regular Thursday 8:30-10 pm EST learning professionals skull session that's happening on Twitter, using the #lrnchat tag. If you ever get stuck, maybe you can jump on and get help there. Best wishes! Thanks for your support and encouragement. I realize it takes patience to build a community, but we are hoping to do just that.